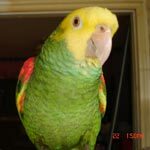 Parrot Forum • View topic - Learning as we go! Re: Learning as we go! Any advise I can get is helpful, so if John has info on this situation, I’m all ears. I think the site crashed for a few days, so I didn’t see your post for a few days. I will do everything possible to keep him comfortable and not perpetuate his condition, and hopefully improve it. He does love to talk to us, and I spend hours talking to him and keeping him company. My ultimate goal, obviously, is to prolong his life and improve his quality of life. I’ll keep you posted! I cut my Amazons fruit and veg breakfast in pieces big enough to pick up. They are the last of my critters to get fed so I give them a nut (pistachio, walnut and such) to hold them off until I get to them. I give them an almond in the shell with supper. I use a tablespoon of lemon juice in two quarts of water to rinse the veg in after it is cut. The juice mixture keeps the fruit and veg fresh all day. I use the frozen mixed veg added to their grain for breakfast. Rainbow and Myrtle both came to me on bad diets. Myrtle only got seed. Rainbow got a lot of junk food. Since Myrtle, my BF, wants anything I have I share while she is on my shoulder. She will eat anything I have and I can add it to their diet. Rainbow, my DTH, leans from Myrtle what is good to eat. I sent John a pm this morning (sorry, I had forgotten to do it earlier). I will help as much as I can but you need to be EXTREMELY observant and I would strongly suggest you keep daily notes about his behavior, appetite and poop. I have a VERY good memory (not as good as it used to be when I was younger but still pretty good) but, with new and sick birds, I always keep notes. Granted that I have a number of birds and you only the one but it still helps to be able to compare notes.